Part 1 is about the larger Shanghai Disney Resort: one of the hotels and Disneytown. While you’re here, don’t forget to check out my previous posts on the perfect Disneyland bag. I first posted that in 2014 and I haven’t had to update it since, so it’s certainly served me well. Also check out Part 2, my guide to Disneyland and Part 3 on the fun snacks in Disneyland! From Pudong Airport, we took a taxi to Toy Story Hotel 玩具总动员酒店. The ride was around 20 minutes and cost around 100 CNY (about S$21). Although the metro/subway is much cheaper, you’d need to make a big loop and then take another shuttle ride. Since there were two of us, it was relatively inexpensive to splurge a little on a taxi for the convenience. 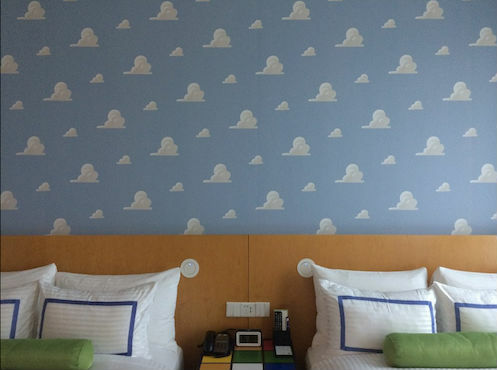 It’s lovely hotel with all the hallmarks of the Disney standard, so you’ll be in good hands. We were a little unlucky, and our room was super far away from the lift lobby. A full 5-7mins walk, which feels like forever when you’re exhausted. We did get to see a bit of the castle and the Tron ride, so that was pretty nice. There is a buffet breakfast available at 138 CNY (S$29) for adults. It’s quite expensive for the simple, mostly child-friendly offerings like dumplings, noodles and local favorites like the soya milk + youtiao combo. We tried it once when we had our very early start, but we ended up DIYing our breakfast for other days. The hotel has several free shuttles, but the main ones you’ll take are the shuttles that go to the Disney metro station (Disney 迪士尼, the last station on Line 11), and the one that goes to Disneytown — that’s the one you’ll take to Disneyland to. The main perk of staying in a Disneyland hotel is the early entry. I’ve stayed in Disney hotels across all six parks and while it’s always appreciated, it’s never felt entirely necessary. So believe me when I say that Shanghai is the first park where you really need the early entry. When you take the Disneytown shuttle from the hotel, you will end up at one of two stops. From 7.15am to around 10am (times may vary), it stops at a side entrance to Disneytown. More importantly, Disneytown has a semi-secret side entrance to the Disneyland park and the early shuttle takes full advantage of this. You skip the lines to enter Disneyland and when you walk into the park, you’ll be much deeper inside – and consequently, closer to the major rides. Unless you buy the paid FastPass option, this may be your only way to ride the super popular rides like Soaring Over The Horizon. After 10am, the shuttle stops at the transport hub, and from there, it’s 5mins walk to Disneytown and then another 5-10mins to the park entrance. Disneytown is Shanghai’s answer to the Downtown Disney shopping area, filled with a mix of eateries and shopping. There’s a range of price points and a good mix of western and Chinese joints. This being a tourist resort, it’s a little pricey – expect to spend at least 50 CNY (S$11) per person. The most economical option is probably the Food Republic food court. 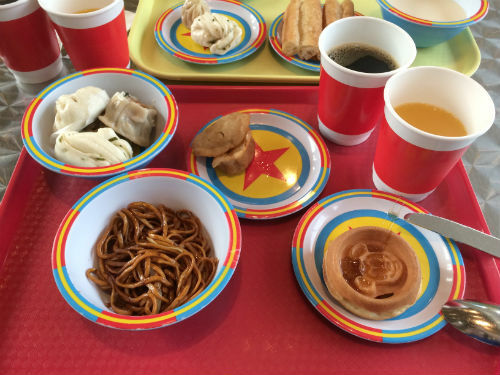 This is home to the only halal eatery throughout Shanghai Disney, a stall called Yershari. Halal in Chinese is 清真. I didn’t really check out the menu though. We had dinner at a mid-range restaurant called The Dining Room 南小馆 which is casual local food, and not too expensive, around 100 CNY (S$22) a person. Their set meals are extremely filling and while I’m not a huge fan of Shanghainese food, I liked their noodles. The main attraction here is the World of Disney store. To be honest, the shopping here is better than inside the Park, so it’s worth stopping by to check it out before you go into Disneyland. While I speak Chinese, I don’t speak it very well, so I was a little apprehensive about the language barrier. After all, it took Hong Kong Disneyland a couple of years to level up their English. The good news is that almost all the Disney cast members (staff) I encountered can speak at least some basic transactional English related to their post, so I rarely had problem. Some of the younger cast members are very fluent, so if all else fails, I expect they’ll be able to get another colleague to help. That being said, I do think that you need someone in your party who can communicate in Chinese to fully appreciate the park. It’s just much easier, and all the in-ride dialogue is in Chinese (although safety and signage information is bilingual). I was able to get by with a little pidgin Chinese. This isn’t a slight on Disney, just a result of how new it is. Watch this space for Part 2 of my guide to Shanghai Disneyland, coming soon!